This article authored by Bill Koch originally appeared in the January 2015 issue of ALM’s LJN LegalTech Newsletter. Womble Carlyle Sandridge & Rice, LLP’s (Womble Carlyle) technology training and online learning programs were in need of an upgrade. The firm’s overall program was originally designed around using local trainers in specific offices to assist with hands-on training and address individual lawyer technology challenges through traditional, classroom-based training methods. Even onboarding of new talent was handled in the traditional way – seat the new hire in a room for days and inundate them with firm applications, policies and procedures. But, unprecedented firm growth, heightened emphasis on developing lawyers’ core technology competencies, and a need to streamline and automate existing eLearning processes led the firm to initiate a fundamental shift. As part of this core change, our firm outsourced its entire technology training delivery and reorganized around on-demand learning, distance learning and virtual coaching. Led by Lori Patton, the firm’s Chief Learning Officer and me, Director of Technology Services, we pursued a new strategy … partnering with technology training and learning specialist Encoretech to develop and deliver the firm’s new live distance training and coaching program. With over 500 lawyers across 14 offices, our firm’s trainers were challenged to cohesively support all staff, locally and remotely. Having physical trainers in certain locations favored those offices and local employee training needs, while hands-on training in non-trainer staffed offices was a bit more challenging, inefficient and often cost prohibitive. In addition to resource challenges, we realized that while the old training model of sending attorneys to training classes to ‘learn Word or Excel’ may work during a major rollout, it did not accommodate their busy schedules nor mirror the way users retain knowledge and learn new skills. The firm realized that technology, new processes and workflows, and new ways of engaging users in training would be the key to success, not increasing the number of tutorials and training sessions being offered in the ‘old’ delivery model. While looking externally to help with this, we brought in longtime partner Encoretech who had just launched Encoretech’s Training-as-a-Service (TaaS), its legal outsourced training and distance learning services offering. Leveraging their extensive distance learning experience from the financial and corporate sectors, Encoretech set out to deliver an outsourced distance training model for legal that would utilize a team of distance learning specialists, leverage a learning management system (LMS), and afford the ability to offer custom live distance coaching, training and e-learning, all based on how users consume content and are best able to process it, when they need it, and in a format of their choosing. We spent a lot of time with Encoretech upfront, but also with a committee of select attorneys, paralegals, secretaries and executive staff to make sure this ‘alternative’ approach would work for our firm and together mapped out a phased approach to executing our new ‘as a service’, outsourced training program. With the invaluable help of our then in-house training team, we phased Encoretech in over a three month period. 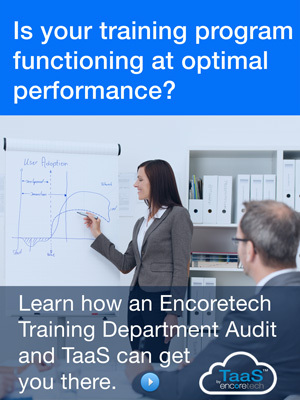 At the end of those transitional months, during which we used the time to get Encoretech up to speed with our nuances and communicate direction to the firm, we were live with the Training-as-a-Service model. 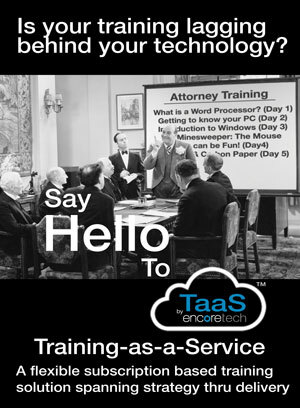 Currently, with the TaaS model in place, traditional law firm training is replaced with on-demand, ‘use-as-you-go’ training and tutorials that busy lawyers and staff can access and tap into when they need it. The content is delivered to them via the web in live online classes, live one-on-one sessions and custom tutorials, all by an Encoretech team of highly skilled distance trainers and content experts available at users’ convenience. Their knowledge of the LMS, development of custom content, and experience as technology and application trainers is specialized and unique. 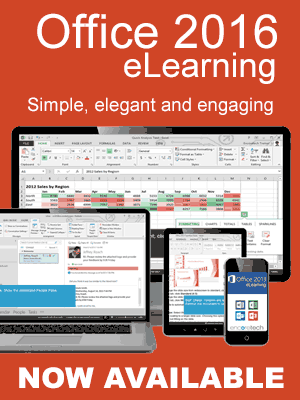 New training delivery formats: On-demand e-learning; live web sessions; virtual classes; one-on-one sessions; and the ability for our users to request any courses and tutorials they might need allow for a more tailored experience for our users. A more tailored experience has meant better engagement and knowledge retention. New training model ‘mentality’: Both the firm and Encoretech realized that modern training is all about delivering knowledge and content to users when they need it most and in a format that fits into their current workflow. As a firm, we also needed to have the confidence that the distance learning program would deliver on that promise and provide information our users really need to work more efficiently and better serve our clients. Though it was a big shift, the model that best aligned with our goals was Training-as-a-Service. Users are more engaged: Now months into the outsourced Training-as-a-Service program, the biggest factor of change and future success is engagement…firm users are completing new on-demand courses, eLearning classes and taking advantage of the many on-demand resources offered by the new LMS including video tutorials and custom training guides designed specifically for us. With user adoption as a primary focus, we collaborated with Encoretech to develop an enablement program that included internal marketing and promotional initiatives to drive training program awareness and most importantly utilization. Measured success: The formation of user committees that help us drive adoption also help us shape the criteria by which we measure successful learning and knowledge retention. With a dramatically improved Learning Management System populated by Encoretech with relevant and impactful materials, we are now able to truly measure and define our successes. 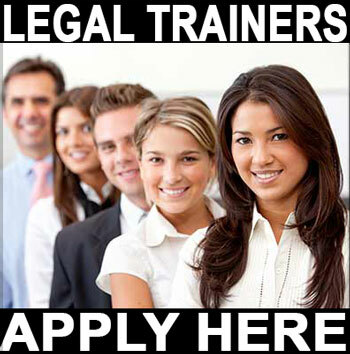 Since the initial training delivery roll-out, our firm has been pleased to see a significant uptake in training participation from the group that was always the most challenging to reach – our lawyers. With over 50 percent currently engaged in learning activities, this is a significant increase over participation levels of the past. Relevant, bite-sized learning modules have been the key ingredient. Lawyers are extremely busy and their time is valuable. Content must be relevant and the knowledge attained must allow them to serve existing clients with more as well as seek new relationships with buyers of legal services in the middle market. Although participation has been very good, we are focused on increasing that percentage with our end-goal of having 100 percent lawyer engagement. The ultimate goal in terms of our learning platform functionality is to have fully fleshed-out learning pathways for the practitioners and their support teams. To do so, we must continue to gain deeper insight into the specific training various practice groups need to serve their clients. Then, prove the value of that training through offerings that are effective because they are ‘just in time and just for them’. This will result in setting attainable goals through learning paths that are not tedious and counterproductive but instead foster a desire for improvement. In this way, we can ensure that each individual has the technology skills clients demand. To further this point, the firm is in the business of helping its clients succeed. Firm success is determined by client success and having practitioners with the technology skills to meet client demands for efficiency while remaining effective is extremely important. Womble’s technology training program fits that bill. Training under this model is targeted and on demand. Targeted in that it allows focus on an individual’s weakest points and on demand in that a person can skill up quickly and move on. Case-in-point, being efficient in technology usage while remaining effective and deeply engaged with clients is what the widely publicized Suffolk/Flaherty Technology Training Audit is all about. And, because of the firm’s fully managed and centralized model backed by user acceptance and genuine thought leadership, Womble Carlyle is prepared.